Hydroxynitrile lyase enzymes (HNLs) catalyze the stereoselective addition of HCN to carbonyl compounds to give valuable chiral hydroxynitriles. The discovery of new sources of HNL activity has been reported several times as the result of extensive screening of diverse plants for cyanogenic activity. Herein we report a two step-method that allows estimation of not only the native size of the active HNL enzyme but also its substrate specificity. Specifically, crude protein extracts from plant tissue are first subjected to blue native-PAGE. The resulting gel is then directly used for an activity assay in which the formation of hydrocyanic acid (HCN) is detected upon the cyanogenesis reaction of any cyanohydrin catalyzed by the enzyme of interest. The same gel may be used with different substrates, thus exploring the enzyme’s substrate scope already on the screening level. 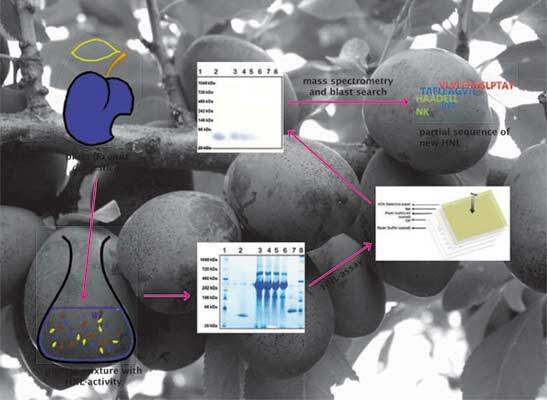 In combination with mass spectrometry, sequence information can be retrieved, which is demonstrated with the example of the so far unknown sequence of Prunus domestica HNL. Biocatalysis, blue native polyacrylamide gel electrophoresis, cyanogenesis, cyanohydrin, enzyme, hydroxynitrile lyase, oxynitrilase, screening. Austrian Centre of Industrial Biotechnology, Petersgasse 14, Graz, Austria.